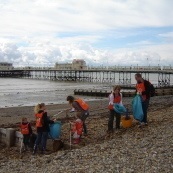 Autumn MCS beach clean and annual litter survey in Worthing. Living Heritage, Transition Worthing, British Sub Aqua Club and Marine Conservation Society are hosting their Coastal Heritage & Sustainability Fair and annual beach clean. Notes for Beach Cleaners: If you would like to attend please email Worthingbeachclean2016@gmail.com to confirm your attendance. • Please register. Children under 14 must be accompanied by an adult. • If wet there will still be a clean-up – cancellation only in extreme weather. 12:30 Registration for Beach Cleaners. Have lunch & browse stands. 3.30 ‘Coastal Climate and Bricks & Mortar’ – join West Sussex Geological Society & Worthing Heritage Alliance on a Geology walk looking at sea defences and built environment! 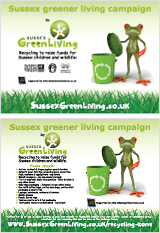 This entry was posted in Children & nature, Events. Bookmark the permalink.